Try these functional fitness / boot camp workouts that will have you on and off the machine, using a variety of equipment (kettlebells, dumbbells, TRX, battle ropes, etc.). Typically these are a little more advanced than our standard rowing workouts, but they can easily be scaled to fit any fitness level. Make it easier: Lower intensity on row/ski/bike. Instead of hollow rocks, just do regular sit-ups. Make it harder: If biking, double the meters or increase intensity for row/ski/bike, add weight to exercises. Need more meters or want to work harder? Repeat the sequence 1-3 times. This workout can be done as a relay in teams of three. Team members begin all three activities in the round, and when the rower completes the 250m piece he or she then tags the next person and everyone switches. Do not move on to the next round until everyone has done every exercise on the current round. On Round 3, team members switch once the runner has completed the run. This workout can also be done by individuals, just do the non-cardio activities (push-ups, frog jumps, etc.) for one minute. Do the three-round circuit twice (for a total of 6 rounds) … unless you challenge the coach, in which case it’s three circuits, for a total of 9 rounds. Set monitor for Intervals>Distance>Unlimited Rest and do the following. Easy paddle cooldown 5 mins. Use your rowing machine for the whole workout if you don’t have access to a SkiErg. 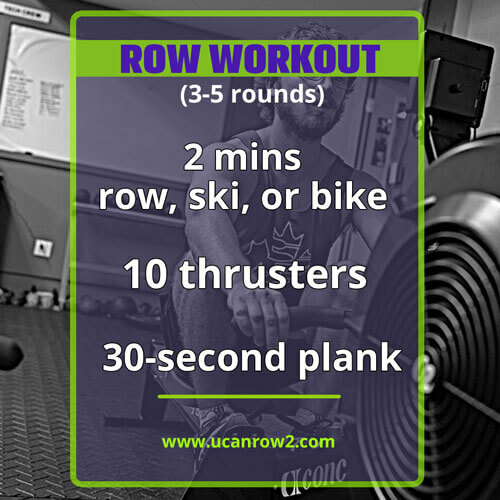 This workout comes courtesy of Concept2 Approved Indoor Rowing Instructor Leeny Hoffman of CrossFit St. Louis. Try it and tell us what you think in the comments!